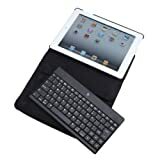 Special protective sheet to protect keyboard and ipad from scratch when close£¬Detachable Bluetooth keyboard can be paired with other device. Hard keyboard, give you the same feel of laptop keyboard. Built-In wireless Bluetooth 2.0 Island-style keyboard. 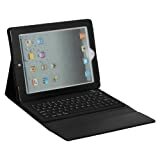 Mamimum scissor keyboard is designed for ipad ipad2 and ipad 3, the keyboard pitch to 16.6mm. The bluetooth keyboard of ipad 3 can be used just by a movement to place ipad 3 on the slot of machine and is the most convenient to use. Enclosure made of aluminum alloys is used to make the machine more attractive, fashionable,and more integration with ipad 3 native. BROADCOM Bluetooth chip reputation in the industry. 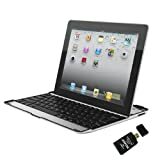 The ipad2 / 3 personalized Bracket keyboard. 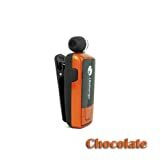 Built-in-rechargeable lithium battery, the charging time is approximately 3-4 hours. Built-in intelligent charging management chip and charge indicator. Low electric prompted indicator. Caps Lock indicator. The item have Pass the CE ROHS WEEE ISO9100 REACH BQB Certificate. Bluetooth support headset mode and Hands-free Mode. Clothes-pin Type Bluetooth Headset, Deduce Discomfort of Banging Ear Headphones. 2012 NEWEST CES AWARDS DESIGN. Human Design and Fashion Bluetooth. Telephone Calls Warning Tone, Reduce Miss Important Calling for You. Beyond the Distance Warning Tone, Reduce Violations Take a Telephone Call. Range of Application: 10.0 m.
The keys can be hit up to 5 million times.